As IBM® continues to enhance the functionality, performance, and availability of IBM Db2®, the utilities have made significant strides towards self-management. IBM Db2 for z/OS utilities is leading the trend towards autonomics. During the last couple of versions of Db2 for z/OS, and through the maintenance stream, new features and enhancements have been delivered to further improve the performance and functionality of the Db2 utilities. The intent of this IBM Redpaper™ publication is to help Db2 Database Administrators, Db2 System Programmers, and anyone who runs Db2 for z/OS utilities implement best practices. The intent of this paper is not to replicate the Db2 for z/OS Utilities Reference Guide or the Db2 for z/OS Installation Guide. 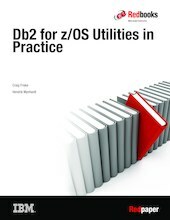 This paper describes and informs you how to apply real-life practical preferred practices for the IBM Db2 for z/OS Utilities Suite. The paper concentrates on the enhancements provided by Db2 utilities, regardless of the version, albeit some functions and features are available only in Db2 12 for IBM z/OS®.